The farmer’s market has been relegated to indoors and their crops of lettuce, tomatoes, corn, and basil have been made way for the roots: carrots, turnips, rutabaga, potatoes (white and sweet), Brussels sprouts, parsnips, beets, and leeks. From October to March, you can find me roasting some combination of root vegetables at least once a week, the variety based on whatever is on sale or what looks good in the bins. Even cauliflower and eggplant take on a different flavor when roasted. With a little bit of olive oil, a dash of Kosher salt, a grind of pepper, and perhaps a small sprinkle of thyme or another herb, the veggies turn out to be crunchy, sweet, and melt in your mouth. 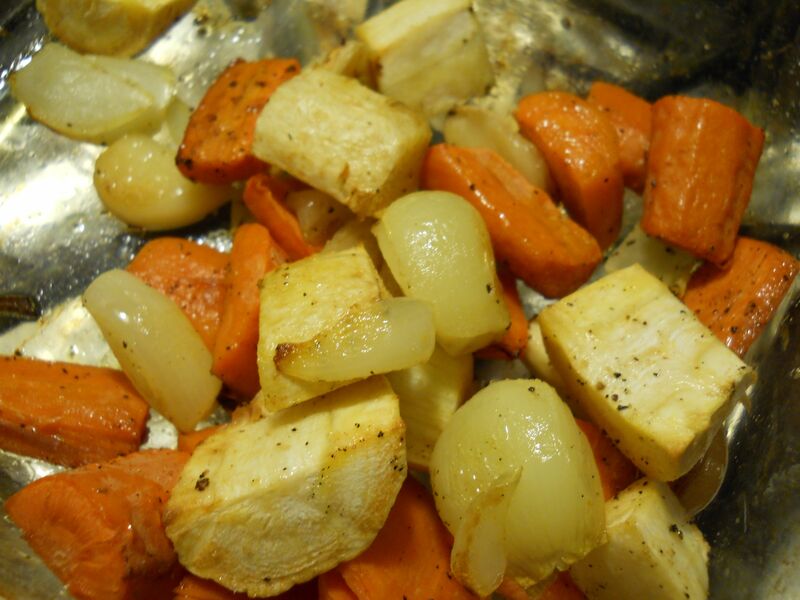 I once heard a tip to roast your vegetables before making a soup instead of sauteing in the pot. Last weekend, I thawed out some homemade chicken broth and chicken I had stored in the freezer, put some cut up carrots, leeks, and celery on a cookie sheet with a little bit of oil and roasted them until they were dark and flavorful. Maybe it was the homemade broth, or maybe I was just lucky that afternoon, but it turned out to be one of the best pots of soup I had made in a long time. I will definitely roast veggies for soup from now on! The following aren’t so much recipes, but an outline on how I roast my veggies, but you can select from what you like or desire. These are baseline basic, how I like them, but there is a cookbook by Vermont author, Andrea Chesman, called Recipes from the Root Cellar. This is a great book to use when I’m looking for something a bit beyond the basic! This was Sunday's roasted roots! This is a rough sketch of what I roast each weekend. Adding the onion or shallots and garlic definitely adds additional zip and flavor. Cut vegetables into large pieces and add to a baking dish. Add a little bit of olive oil, some salt and pepper. Place in a preheated 375 degree oven. Cook until veggies are soft, yet brown, and serve. This is so easy and delicious and can made for a dinner for one or ten. Crispy leeks with crispy Brussels sprouts, it’s the best! You can do the proportions to your taste. Gently slice the Brussels sprouts thinly and add them to a non-stick baking pan. Add leeks, a little bit of olive oil, mix, and top with salt and pepper. Cook at 375 degrees, stirring occasionally, until everything is brown and crispy. These are the best! Crispy on the outside, soft in the middle, these go with everything, from meatloaf to fish and everything in between. Take two washed sweet potatoes (leave the skins on), cut in half lengthwise, and cut into wedges. Place on a cookie sheet and add a little bit of olive oil and toss. Bake at 375 degrees and stir on occasion. Cook until they are dark. Add a little bit of salt before serving. If my hands are pink, you know I’ve been cooking beets! I make this in the summer and winter. Again, not so much as a recipe as an outline. 1. Take a few beets (don’t peel), scrub clean, and place in a shallow pie pan with a little bit of water and cover with foil. Cook at 375 degrees for 45 minutes or so, or a knife test in the middle shows they are done. When cool, peel and dice the beets. 2. Wash and peel a few beets and place on a pan with a little bit of oil. Cook at 375 degrees until soft. In a bowl, add the diced beets, a few dashes of vinegar (I like sherry), and a little bit of thinly sliced red onion, if desired. I, too, love roasted vegetables, but forget to fix them—thanks for the reminder.